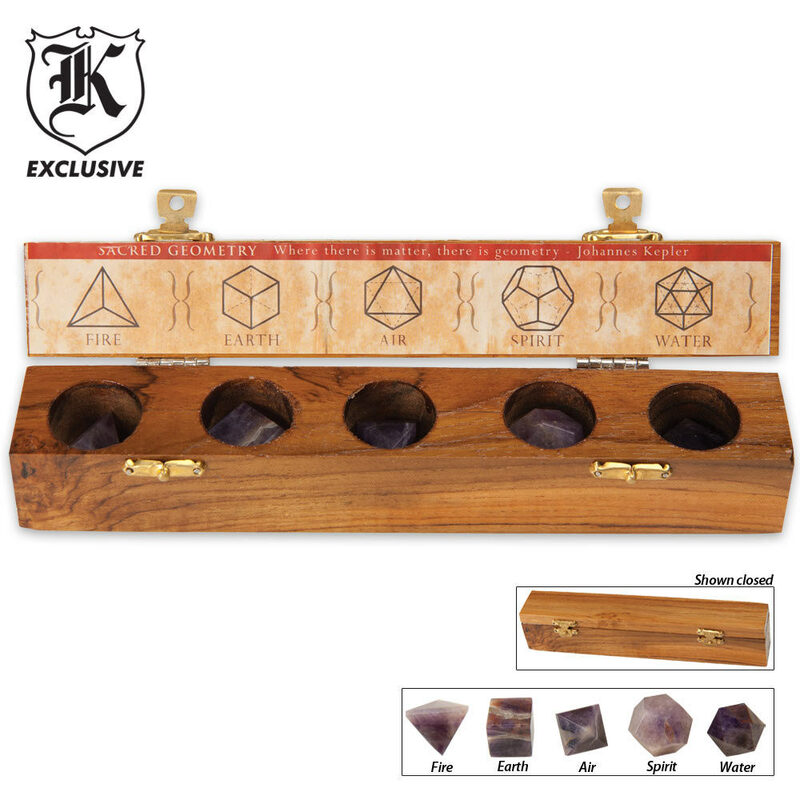 This sacred geometry set includes a wooden box to store and display the amethyst shapes of the Five Platonic Solids. Plato called these geometric shapes "the building blocks of creation," asserting that their structural harmony brought order to chaos. There are five shapes that represent the five platonic solids. The Tetrahedron represents the element of fire and symbolizes willpower, courage, passion and self-definition. The Hexahedron represents the earth and symbolizes the stability, power and physical action. The Octahedron represents the air and symbolizes intellect, inspiration, new beginnings and mental activity. The Icosahedron represents the element of water and symbolizes emotions, dreams and intuition. Finally, the Dodecahedron represents the element of Spirit and symbolizes the divine connection, the universe, completion and wholeness. Use these special stones in energy work, Reiki, Chakra Balancing, cleansing, meditation, Feng Shui, when working with dreams and in all healing and ceremonial rituals. Box measures 8 1/4 in. x 1 1/4 in. x 1 3/4 in. overall. Product is well constructed, along with the beautifully crafted wooden box. I immediately sensed it's power as soon as the UPS delivery pulled up in my driveway. I felt it even more after I have received it and opened the box. My chakra has never been stronger. I am now able to withstand a lot of pain while holding these in my hand. Using a 12 oz ballpeen hammer , I struck my right hand with full force. I hardly felt anything. I will try to test it's powers some more, and will submit a new review soon. The Illustrations are nicely done, giving a full 3D perspective on each shape. Along with physical amethist crystals that give a simplistic, yet complex examples of the order that takes place in all matter, energies and the matrix of space-time. A must for any aspiring scientist, as they`re the blueprints of creation and the universe. 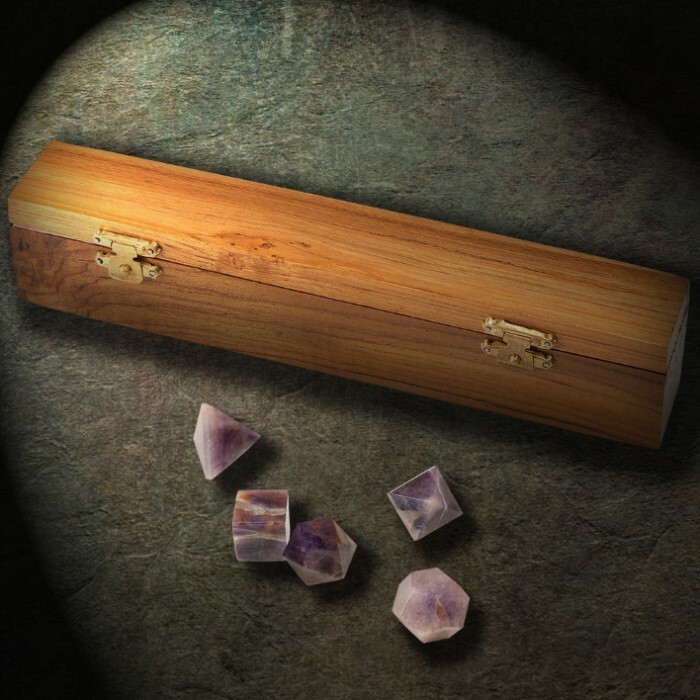 These amethyst are a great gift for any one on the spiritual path. they have a rich purple semitransparent appearance, with a very nice storage/display box.